Almost everyone has read a newspaper of some kind at some point. Many of us read a paper every day, and we’d be lost without them. But apart from keeping us up to date with the news, they can also been a boon for family historians. Why? It’s not just for the obituaries, although those can be a wonderful resource, but also for the stories, especially in local papers, which can include ancestors and relatives, and can bring a greater level of understanding to events in the area. 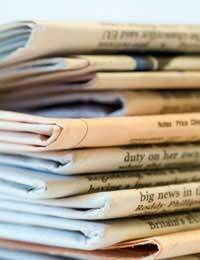 Newspapers have been around for about 300 years, published in different cities and only later nationally. That means, the further you go back, the more local news you’re going to find, which, for family history purposes, is wonderful, since names are named, and events, even fairly trivial ones, are described in detail. The obituaries are usually of more prominent citizens, which means that the majority of people vanished into the hereafter are not celebrated in print. But if your ancestors held any kind of position locally, there would have been an obituary, which will often reveal facts you’d be unlikely to find elsewhere (and there would also be news stories involving them during their lives). Those things make newspapers an important, and often vital, resource, and one anyone involved in researching a family tree needs to use. Back copies of newspapers will be found in the central libraries of towns where they were published, and most should have complete collections. Discovering the information you might need isn’t too easy, since there are often no indexes to help you. The best place to start is at the end, with the death of your ancestor, especially if you have an exact date, and not just a year (and after 1837, a complete date will be easy to obtain). Look around the date of death, up to two months after, and see if an obituary has been published. If you can locate one, then there’s a good chance there will be other stories about your ancestor – and that’s where your work really starts. Go back to the beginning now, and see if there’s a birth announcement, and then, if you know the marriage date, look for an announcement of that, and also the birth of any children. From there – and this becomes a real labour – you can work your way through the issues covering your ancestor’s life span and see if he or she is mentioned. Thankfully, the British Library does have a number of newspapers that have been digitised, and are searchable. If the ones you need are among these, then it will make your job a lot easier and faster. It’s also worth searching all the legal notices in a newspaper, since it’s possible your ancestor could have been involved in legal proceedings. What Else Can be Gained from Newspapers? Newspapers can help give a context to the lives of those who lived 100 or more years ago. Reading them, you can see the issues that were important locally, the ups and downs, the disasters (fires, floods and more) that affected the community. While these aren’t exactly vital to your family tree, they do fill out the picture of the time, and even small things let you see more of the things your relatives faced, which brings greater understanding – and that’s always a good thing. I have a discrepancy I need to clear.It concerns St. Hugh Grantham of Grantham, Lincolnshire, England, a ...great uncle of mine.According to what I find in local historical stories from the internet and supposedly gleaned from Grantham, Englandrecords, St. Hugh Grantham, son of William Grantham and wife, Mary West (dau. of John West), lived from 1246 ad to 1255 ad.All of the family tree records through Ancestry and LDS records show the same St. Hugh Grantham lived from c. 1203-1212 ad.Burke's family records state that St. Hugh Grantham lived in the time of Richard I, whose lifespan was from 1157 to 1199 ad. It is important for me to determine which source and which years to believe.I realize it's not that much difference, but it's two generations. I'm not sure what to do now.Please help if you can.Thank you so much.